The goal was simple enough. I wanted to get one good photo of a fairly small brookie with a particular spinning rod that should be just ideal for small fish (maybe even micros). How hard could it be? Well, perhaps I should have gone to a stream where I had actually caught brookies before rather than relying on reports - even if the reports did come from brookie-meisters. 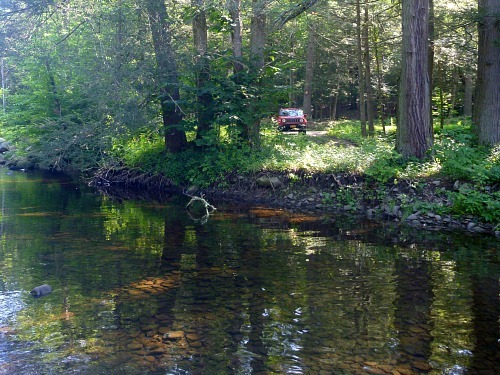 Perhaps the second mistake was picking a stream I could drive to - even in a Jeep (although one could argue that a Jeep Renegade is really just a Fiat in Jeep's clothing). One of the guys who told me about fishing there later said essentially you don't fish THERE, you fish a section of the stream you have to hike to. Recalling afterwards that the best pool I saw on the whole stream had gotten taken over by an extended family (four cars worth!) with huge coolers and folding chairs and beach towels just before I got to it, I have to admit he was probably right. The third mistake was fishing for little trout with barbless hooks. I know everyone says they don't lose any more fish because the hooks are barbless. To that, all I can say is "Yeah, right!" Little fish wriggle off barbless hooks. Fifteen inchers are easy to land barbless. Five inchers? Forget it. Before Sunday, I don't think I had ever seen a brookie jump. Well, I can assure you that little brookies literally jump off barbless hooks. I did manage to catch one brookie. I did not manage to get a good photo of it. I thought the rod came out great. The rod didn't wriggle. The little brookie, though? It wouldn't stop wriggling. 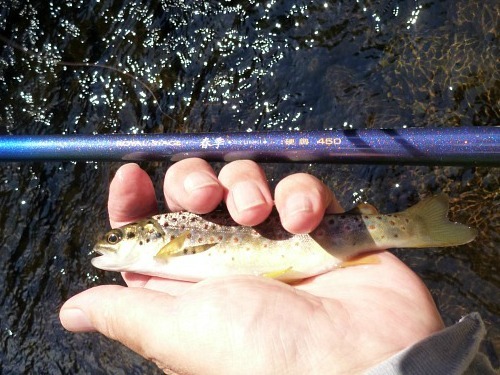 The rod is an extra extra ultralight, and really is fun with small fish, but it will be a while before I can write it up. I need a photo. I may have to settle for a photo of a small sunny or maybe a creek chub - but for a rod that should be fun even with micros, that may not be a bad thing. When Plan A doesn't work out, and it's already after lunch and the swimmers are showing up in ever increasing numbers, it's nice to have a Plan B. On Sunday, Plan B was to see if the TenkaraBum Tactical Nymphing Sighter would work well for Ultralight Worm Fishing. That wasn't much of a stretch. I was sure it would. 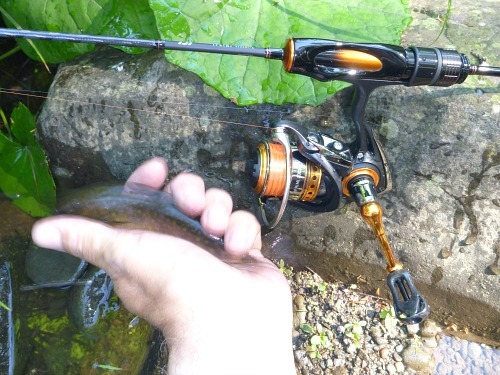 For the test - well, not really for the test, for the tug - I chose the Nissin Royal Stage Syunki 450, which is as close to an ideal rod for Ultralight Worm Fishing as you are going to find. It is long enough to give you good casting distance and soft enough that you'll never cast the worm off the hook. You can use a very light line, which will have just enough line sag to register a strike before the fish feels any tension. Using about a foot of the white section of the TenkaraBum Tactical Nymphing Sighter .010, along with a casting line of Varivas 1X tippet (both of which are Japanese line size 2.5), the casting was just as smooth as if I had used the size 2.5 Nissin Oni tenkara line. I didn't get a photo of the sighter in the water because it hadn't been in the water more than a few seconds before it shot forward a few inches. It does not take a very big fish to give you a clear indication of a hit. The sighter is really very sensitive. I tried to get a good shot later, and although the sighter is also really quite visible it is also really quite hard to photograph (at least with my camera and my skill level - or perhaps more accurately, with any camera and my skill level). By then it really did seem like I was trying to fish in a swimming pool so I left to do a little Ultralight Worm Fishing on a stream I knew that I knew would have bigger fish. No brookies, but then again, no bathers. I only stayed for a couple more fish before calling it a day. I didn't get the photo I wanted, and I didn't get the solitude on a nice little brookie stream I wanted, and a few more stocked rainbows weren't going to change that. 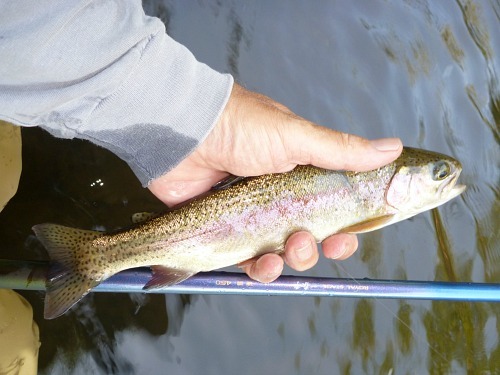 Now, understand that there's nothing wrong with catching stocked rainbows if that's what you set out to do, but if it's already getting late and it's already Plan C, a couple fish is enough to cap off the day.